Artento Divini – Exclusive mix for bejbi.se. The 31:st of our series of exclusive mixes..
Click ”see the rest of this entry” to read more about Artento Divini and to download the mix. At the age of 19 the young and enthousiastic Ard Schilderink discovers the world of house music after being a successful cyclist and seeing many parts of Europe. His love for four measured beats starts to grow on him and resulted in buying his very own pair of turntables. Just like every DJ he started practicing the art of mixing, whichlead to competing in several mixingcontests and, even more important, conquering these gauntlets. In 2002 Artento headlined the Brazilian festival Eco System and ended up touring this country for over three months and playing small hotspots in a.o. Manaus andother cities bordering the Amazone river. Trying out different styles of music, slowly hissound developped into the style Divini plays nowadays. In 2006 Artento and his former partner in crime Melvin Warningadded a new chapter to his starshooting career by producing the massive clubhit ’Divini & Warning – 4LB’. Tiësto played it at Sensation White during his30 minutes surprise-guest-performance,Armin van Buuren started off his set at Dance Valley 2006 playing ’4LB’ and Sander van Doorn even used this ’Radio 538 Dance Smash Hit’ on his Dance Valley mix compilation, so the impact of this first release was extremely big. Their second single ’Chaib’ was dedicated to a special friend who sadly past away afterbeing involved in a diving accident at the island of Curaçao. 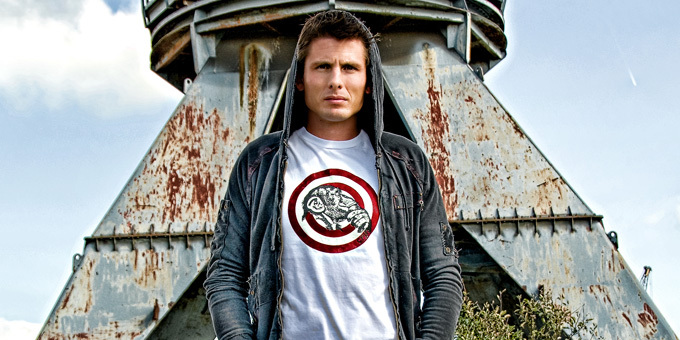 Artento Divini: ”He lives on in our hearts, also through this record”. At some point Divini and Warning both decided to pick up their solo careers again and separated ways. Soon Artento’s first solo release had reached the CD wallets of many renowned DJs. ’Pulse’ was released on 2Play Records and even Eddie Halliwell played this track on his BBC 1 radio show. But the biggest solo-hit till now was yet to come. ’Reflex’ has really established Artento Divini’s name within the scene; Sander van Doorn’s DOORN Records picked up this future classic release and made it get stuck at the number two spot of the Beatport-charts for several weeks. Even Australia and New-Zealand will be Reflexed, Central Station has signed this belter exclusively for named territory. Artento’s remixes have also become very popular, he has rebuilt tracks like ’Jochen Miller – Lost Connection” (Marco V started off his set with this one at Sensation White 2008), ’Fausto – Lupara’ and the near future will show that Divini has got some more remix tricks up his sleeve. Also his bootlegs have become enormously popular, Depeche Mode’s ’Personal Jesus’ and ’Hide U’ by Kosheen were given the Artento treatment and both go down a storm on the dance floor. Now he is the 31:st out for a series of exclusive mixes recorded for bejbi.se by our favorite dj´s, both well known, and unknown, that we will publish once a week untill we run dry. Download Artento Divini´s Exclusive mix here (right click and save as) or listen to it live on Soundcloud or just press play below here. If you want more of Artento Divini, check out his radioshow Front of My Bag on sense.fm or his homepage for more info.